Instructors from Silverstone International have entered the final stages of a Pan-European driving programme to introduce the Nissan GT-R to more than 1,300 pre-sold customers. The 19-date run at Germany’s Nurburgring follows the successful debut of the experience at the home of the British Grand Prix in August, where more than 500 owners got to grips with the super saloon car for the first time. 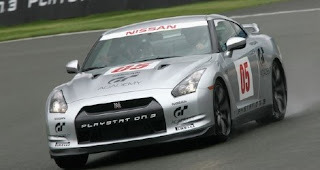 Under the logistical arm of Silverstone International, the initial two stages of the ground-breaking ‘Best in Class’ Nissan Academy allowed customers to experience the phenomenal performance of the GT-R as well as learn important advanced driving techniques. “Half of those who attended had been on other drive experiences, but 98 per cent of them were unanimous that the Academy was their best one yet,” explained Jonathan Tait, Sales & Marketing Director, Silverstone International. Further sessions, including the opportunity to take a full race licence test, will be held during 2009. Nissan and Silverstone are working on an even bigger offering of driving experiences for Passionate Sports car driver’s that will be rolled out in 2009. European deliveries of the GT-R supercar will start in April 2009. Currently the waiting list is 18 months in the UK. Just a few more months for the UK guys. Just done it at the Nurburgring ten days ago, and I can confirm the event was flawless. Thecar is amazingly easy to drive, both on regular roads and tracks. Very easy to drive fast. Just like the R32 , R33, and R34 . The GT-R has been faster than many of its contemporaries. I remember watching videos of the R32 on Fuji in 1991 when I was in Japan. It was destroying all the cars it was racing against.